including Great War Dundee, Scotland’s print & publishing industries and Scottish landed estates, their owners & management. including early modern ballads and elegies, theatre, Gothic & Romanticism, science fiction, and the Dundee comics industry. including film art, illustration, animation, interior design, textiles, portraiture, and the visual culture of Gaelic Scotland. This guest post comes from Suzanne Black, second-year PhD candidate in English literature at the University of Edinburgh, who attended a recent event in our 21st-Century Book Historian series. The series is a collaboration between the Universities of Edinburgh, Stirling and Dundee which provides PhD students with hands-on training in the History of Printing, Publishing and Authorship. Dundee will be hosting the next event, Authorship, on Thursday 26th April – sign up here. In the first in a series of three events organised by Dr Katie Halsey (University of Stirling), Dr Daniel Cook (University of Dundee) and Dr Tom Mole (University of Edinburgh) and funded by the Scottish Graduate School for Arts & Humanities, graduate students from all over Scotland gathered in Stirling on the 21st of February 2018 to learn about the history of printing and how it can be approached and understood by contemporary book historians. Aimed at those who work with early texts and those who are just curious about the field, the afternoon offered a history of early printing techniques, a talk on the methodological difficulties in assigning provenance to incunabula (really old books from before 1501) and, the part that I was most excited about, hands-on learning. As a doctoral researcher who specialises in print and digital fiction from the 21st century, I was keen to learn about book history in order to better understand the situation of 21st-century publishing in a continuum of changing technologies and media, and I was not disappointed. After introductions from Dr Halsey, Dr Kelsey Jackson Williams (University of Stirling) and Dr Dawn Hollis (University of St Andrews), who are the two lead printers of the Pathfoot Press, provided an introduction to print culture and methods, augmenting their scholarly knowledge with practical experience gained from trying to recreate letter press publications on the Press’s beautiful 19th-century Columbian press, an elaborately-wrought, hefty piece of apparatus topped with an extravagant bald eagle counterweight. Drs Jackson Williams and Hollis talked us through the labour-intensive process of how a printer would create lines of type from individual letters (compositing), compile multiple lines of type into a frame (or chase) and secure them so that the whole (called a forme) could be printed without letters falling out of place, as well as correctly orient multiple pages from different parts of the book on one large sheet of paper (tricky), proofread to identify errors, dry the sheets, fold them (to create the desired orientation, such as folio or quarto) and finally bind them (although this was often done elsewhere). 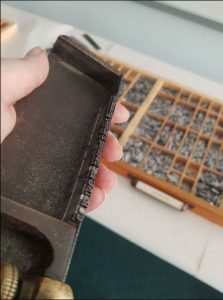 I was surprised to find out the origin of some current printing terms, for example, the type for the individual capital and lowercase letters was often located in separate rows of cases, which led to the designation of ‘uppercase’ and ‘lowercase’. If you were wondering, Garamond is the contemporary font or typeface closest to those used by 17th-century printers. 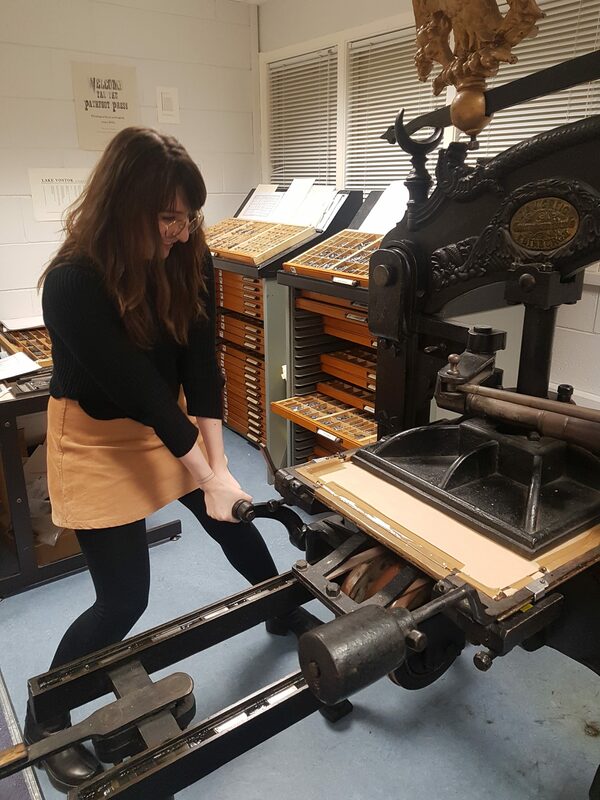 After walking us through the theory, we were able to get our hands dirty arranging lines of moveable type (single letters) which, being fiddly and with the letters appearing reversed, is not easy and our best efforts led to some unfortunate typos! 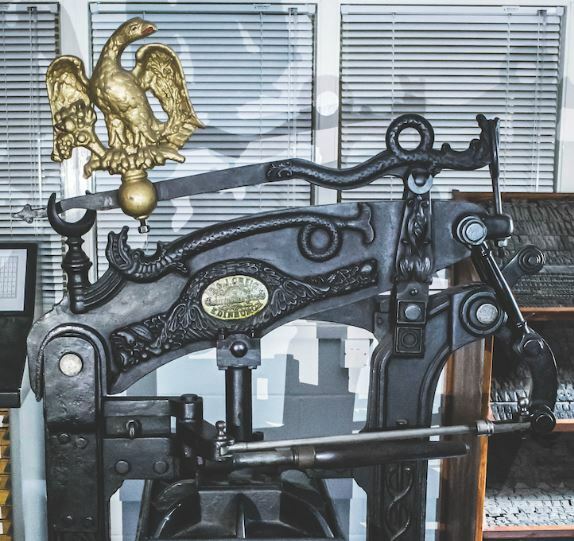 Working the two-person Columbian press was also a challenge as strength, accuracy and delicacy are needed to align paper, forme and weight to ensure a uniform print. Luckily, with Dawn and Kelsey supervising, we were all able to produce a printed sheet by the end of the afternoon and, as a special bonus, we were also able to use a table-top letter press from the 1920s to print a beautiful souvenir bookmark, designed by Pathfoot Press intern Mhairi Rutherford (pictured at the top of this post). While I was feeling flush with my newfound appreciation for printed books, Jamie Cumby (University of St Andrews) gave a talk on older texts (incunabula) and the difficulties of ascertaining their publication and ownership histories. Combined with Daryl Green’s additional comments on provenance research, I came away from the event with a greater understanding of the materiality of books over the last few hundred years and, inspired by the Pathfoot Press, at least a few of us were already plotting to undertake our own letter press printing. And where does pie come into it? Well, it’s usually spelled ‘pye’ and refers to jumbled up piles of movable type, perhaps created by dropping them on the floor, something that, under the excellent tutelage of Kelsey and Dawn, we were able to avoid. 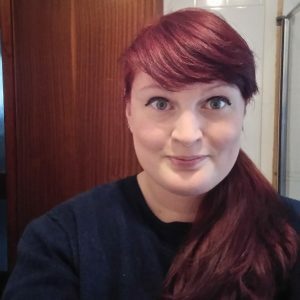 Suzanne Black is a second-year PhD candidate in English literature at the University of Edinburgh. She is interested in how digital fictions, such as fanfiction, and representations of the digital in printed contemporary fiction can be understood in the contexts of intertextuality, narratology, digital media, feminist theory and digital humanities techniques. @suzannerblack on Twitter.